Exar Kun has fallen, and the Sith have dispersed back to the shadows. The Republic stood still on this platform of victory. Where does the galaxy go from here? Peace and order has a chance to thrive in the new age with the Sith having been defeated. The Jedi have reached a peak of power, a golden age for their order. Their strength and their numbers have never been greater. The Republic recovers and stability and democracy has a chance to build. The Jedi Masters have seen an opportunity to train their padawans in a time without war. Order and serenity are the words of the era. Meditation, saber practice, and controlled education on Dantooine and Coruscant prepare the coming Masters to further establish a long lasting peace for the galaxy. Students with a yearning for knowledge remind the order of Exar Kun, and certain Masters watches those students with suspicion. Only criminal syndicates, smugglers, and usual political issues are the major problems of the age. A time of growing things and harmonious friendships, undisturbed by the dark. Out on the Outer Rims, a darkness has swept itself over the Mandalorian Clans. The old Mandalorian crusaders have been transformed into a new order by Mandalore the Ultimate. A being of power, a man who can lead with fierce determination. No Mandalore before him has wielded such strength, and the men follow him for the darkness has promised the ultimate gift. A war of absolute glory with the Republic. Neutral planets are quietly being pillaged and burned. Mandalorians build their numbers and their economic strength. Amidst the peace, the fires will soon reach Republic space. It is inevitable. War is coming, and what will the men and women who hear the call do when the fires begin to burn around them? The galaxy is at peace, and there is a stillness of the time. War veterans remember the hardships of the Exar Kun war and the numerous Jedis turned to the darkness, and the heartfelt betrayals. But, now, there is peace. Jedi train and hang out with their friends at the temples much like students at a local training academy. Republic veterans relax and hope to live out the rest of their days with no more conflict. Young recruits are bright eyed and eager to live up to the legacy of those before them. But, the Mandalorian threat unseen on the outer rim will prevent such a peace from lasting. A darkness behind the Neo-Crusaders unknown casts it shadow upon all the things to come. War waits again, and this time the years of fire and death will reign for a seemingly endless time. We, the Republic, shall fight this threat. Soldiers tasting the most vicious combat they’ve ever seen, untested and green. Jedi so used to living without conflict will be thrown into the heart of it. We will not have the fortune to be molded by the gentle fingers of serenity, no. Instead, we shall be forged by the cruel sting of flame. Not everyone will make it out, and those that survive shall remember it forever. We will be a generation torn, a lost generation where paradise is a fallen concept. We will make friends, we will make enemies, we will fight with each other and learn with each other. We will love, and we will trust… and betray with hate. How shall we decide our fates? I look forward to seeing the outcome. Small note: I shall control a female Revan for story-telling purposes, and other NPCs as we go along. I welcome other NPCs so long as we don’t get too thrown off our course. I will try to operate in a mostly GM-sort of fashion. No news on whether I’ll take on a co-GM, but I will consider it. Keep in mind, people will die in this unless they are canon characters who live past the wars. OCs will live too, just don’t get too attached. I promise, however, that I don’t intend for premature deaths unless it’s warranted. Codes of Honor with the Mandalorians originated with the Canons of Honor. ▪	Strength is life, for the strong have the right to rule. ▪	Honor is life, for with no honor one may as well be dead. ▪	Loyalty is life, for without one's clan one has no purpose. ▪	Death is life, one should die as they have lived. Another majorly important aspect of Mandalorian life is the Resol’nare. The Resol'nare, or Six Actions when translated from Mando'a into Galactic Basic Standard, were the central tenets of Mandalorian life. They consisted of wearing armor, speaking the language, defending oneself and family, raising your children as Mandalorians, contributing to the clan's welfare, and when called upon by the Mand'alor, rallying to their cause. Tradition dictated that anyone who wished to be considered Mandalorian were to abide by these guidelines and live these actions daily. Mandalorians whom did not follow the Resol'nare were considered to be dar'manda—someone who was ignorant of their Mandalorian heritage and bereft of their Mandalorian soul. The status of dar'manda was widely feared within Mandalorian society due to the belief it meant they were soulless and had no place in the Manda, the Mandalorian afterlife. Before and during the Mandalorian Wars, any and all non-Mandalorians were considered dar'manda and soulless from birth, until they joined the Mandalorians and lived by the Resol'nare. Groups of captured individuals would often be forcibly inducted into Mandalorian culture, and made to swear by the Resol'nare with or without their consent under the threat of death. Young Mandalorian children were taught a rhyme to help them learn the tenets of the Resol'nare, and their parents would explain the cultural significance of each tenet as they grew. The Neo-Crusader movement arose during the veterans of the Great Sith War discontent about how the Crusaders performed in the war: excellent at pillaging and destroying Republic installations, they were not nearly as efficient at exploiting their conquests. With the Crusader ethic focused on fighting the next battle, the Great Sith War provided the Mandalorians with little time to exploit their gains: huge industrial complexes conquered remained idle rather than rearming the Mando'ade, and millions of potential recruits who might have been brought into the movement were not. Ascribing this flaw to the lack of order arising from their nomadic lifestyle, a small group of enthusiasts calling themselves Neo-Crusaders took residence on the planet Mandalore. They adopted a rudimentary chain of command and division of labor, not found in the traditional culture. Many Mandalorians found this bizarre, but some took interest in the Neo-Crusaders. When the Mandalorians again began to raid nonaligned worlds, the Neo-Crusaders won their share of battles due to their discipline. Sensing an opportunity, Mandalore the Ultimate and his closest assistant Cassus Fett decided to encourage the movement. Cassus refined the former cult's organizational strategies for use on a larger scale. 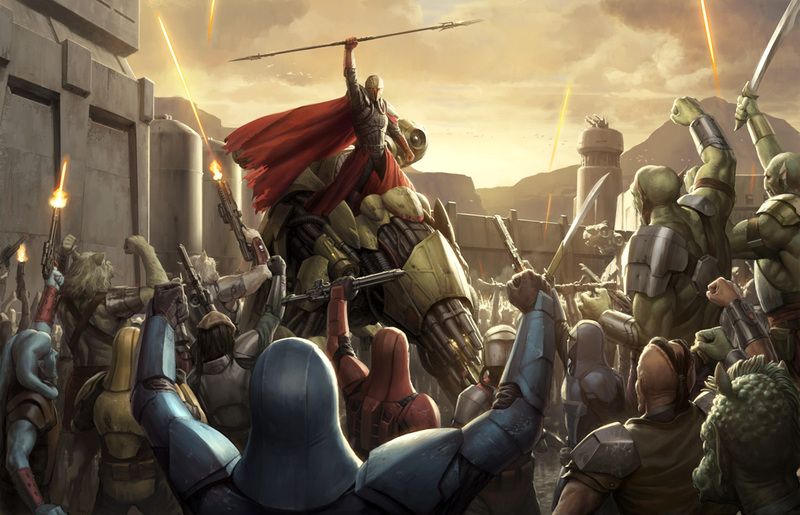 The Mandalorians who tested the Republic in the early skirmishes found that they had a distinct advantage with Neo-Crusaders as their vanguard. 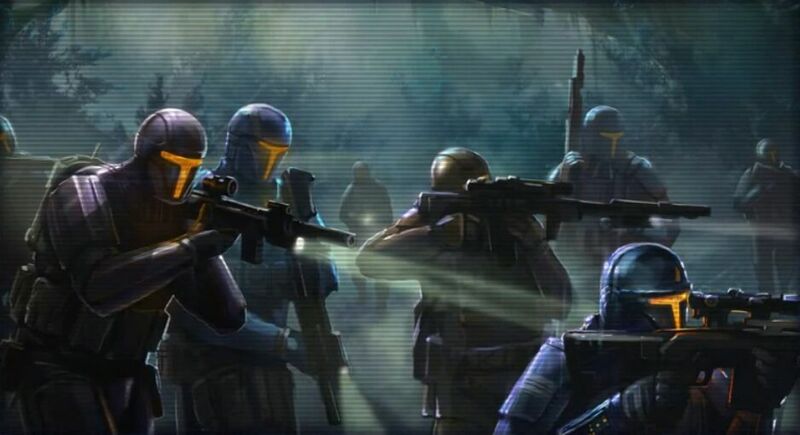 By the time the wider Mandalorian Wars with the Republic finally broke out, Neo-Crusaders were present in every unit, boosting morale and spreading the new ideals and discipline. When the Mandalorians took Republic worlds, they immediately located potential recruits. Shipped to training centers, the new recruits were taught by Neo-Crusaders to become the Neo-Crusaders. Traditional Mandalorians were encouraged to adopt the system as well, although some were distressed by the changes. The Mandalorians of the past were voluntarily committed to the cause, but Neo-Crusaders increasingly included warriors of poor quality who joined to escape occupation or to simply gain their share in the pillaging. Mandalore the Ultimate, or Te Ani'la Mand'alor in Mando'a, led the Mandalorians during the Mandalorian Wars. One of the last Taung to claim the Mandalore title, and known to some as the Great Shadow Father, he regrouped the Mandalorian forces into the Mandalorian Neo-Crusaders and slowly began to conquer fringe worlds that had been left defenseless in the wake of the Great Sith War. 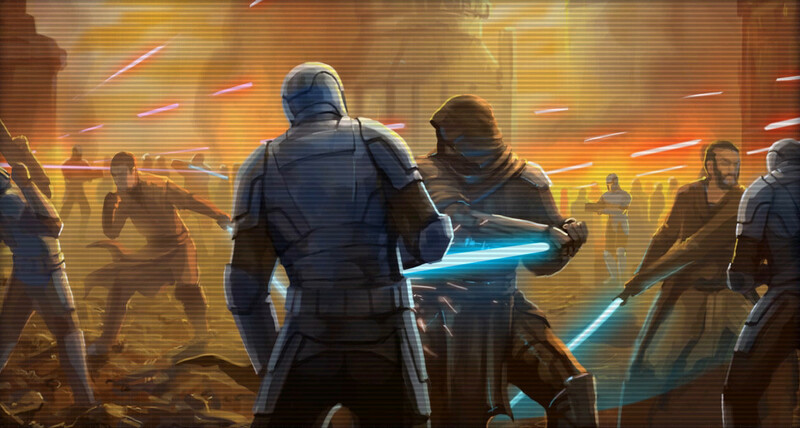 Mandalore took full advantage of the Galactic Republic's halfhearted efforts to oppose his aggression and personally led his forces as they invaded Republic territory. Make as many OCs as you like. We might run through quite a few. This is war, after all. Other canon characters of the time are welcome, and I will choose those who I feel best capture the voice of those characters within their CSes. HK-47, Canderous, I probably won’t take those until a later time. Carth, Bastila, Saul Karath, Alek (Malak), Arren Kae (Kreia), Bao-Dur, Atton Rand, etc. are welcome. Theme Song: Include this at your leisure, you don’t have to. It’s just for fun. Appearance: Photographs if you want, but you must also accompany it with a written description. You can forgo a photograph if you simply want the written description. Background/History: How well do they know their parents? Are their parents alive? Do they have a well-put together family or are they estranged? How did they end up as a smuggler, Jedi, mercenary, or Republic solider (or anything else that isn’t Sith or a Mandalorian Neo-Crusader)? What were significant events that shaped them to who they are now? Personality: I want you to be rather detailed here, so I’m going to throw in multiple aspects of this part of the sheet. Likes/Dislikes should be included here. They like pazaak? Hunting? Reading? Do they hate fighting with a lightsaber and prefer a more peace of mind approach to the Jedi way (or whatever code of life they follow)? What’s their sense of humor like? Emotional state? Current emotional state that is. What does it take for them to break? What is your character’s reputation? Virtues and Vices? For example, is your character patient; but also judgmental? Perception of the world, and other situations around them? What’s important to them right now? Primary goals? Secondary goals? Get a sense of what is prioritized by your character. What are your character’s skills in their current job? If you’re a padawan or knight, what is your characters most suited for? Are they a Jedi Guardian, Sentinel, or Consular? More prone to diplomacy than force or vice versa? Are they a good healer? Good in lightsaber combat? If you’re a soldier, are you more mechanic/engineer oriented? Or, are you a scout and a scavenger for helpful items? Or, are you a front lines soldier skilled with weaponry? As a smuggler, are you more stealthy than you are persuasive? Or are you more deceptive with your words in order to evade having to resort to stealth? Same things around here apply to mercenaries. Think about your specialties. Engineering, computers, locks, or… guns, blades, grenades or… explosives, demolitions, etc. For the Jedi, what are your force powers. Think about this when it comes to your characters skills and personalities. 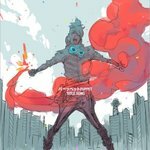 Is there a reason why your characters force powers may be contrary to who he is? He or she could be confused, predisposed to the lures of the dark side. More healing and protection focused than offensive force powers? More assault based than defense? What is your characters fighting style like? How many different languages to they speak? If your character isn’t in regular contact with Aliens, they may not speak many languages other than galactic basic. Studious Jedi? Probably more languages. Remember to include strengths and weaknesses when it comes to their skillsets. When it comes to relationships with others, say Jedi amongst Jedi on either Coruscant or Dantooine; I will let you talk amongst each other about what your relationships are before hand so we don’t necessarily have to go through characters meeting each other right off the bat in certain cases. Variety here may allow us some interesting dynamics. We’re not children (some of us anyway, I really have no idea). So, I don’t think I need to weigh everyone down too much with this section. Goes without saying that any adult scenes fade to black or go to PM. Romance is accepted, and encouraged, but make sure it feels real. Don’t be afraid to write though, throw things out there. Don’t try to force any romances, they can poison the experience. Let things flow naturally, the unexpected interactions are quite nice; believe me. Be nice if we have a fair deal of OOC chatter. I love building a fun back and forth with you all. Throwing ideas out, getting chemistry and all that. Feel free to make jokes on anything, I’m not offended. I’m rather friendly. I expect you all to push yourselves to the limits of your writing and then break them. Multi paragraph posts. I am not a grammar Nazi, so long as you’re making an effort for in-depth characters and are truly contributing to the story-line I am more keen on being forgiving. Feel free to have me re-read your posts before you post them, I can help with grammar and spelling mistakes. Limit drama in the OOC, if that’s cool with everyone. Shouldn’t be too hard, yeah? Read all the posts. Pay attention to them and do not ignore something that someone has written. Also, read up on some lore and races. Don’t overdo it, I still plan this to be mostly our own spin of the Mandalorian Wars and onward. That’s all, I believe. Oh, HAVE FUN! Peace, love, and hugs y’all. I AM SOOO EXCITED !!! I will get to wrokr as quickly as i can. Lightsaber Type: Single bladed lightsaber, purple crystal. Appearance: Aria does not stand at an imposing height, but there’s always a presence about her wherever she is. Her uniquely violet eyes always appear thoughtful and meditative; ‘piercing’ as Master Zhar Lestin frequently comments when raving about his student. Shoulder length raven colored hair, a thin yet toned frame as she has taken to routine exercise. If you need an image, here are two. Just think a bit shorter hair. I prefer the darker tone of colors myself, sets the ‘Revan’ mystique I’m going for lol. Background: Parents: unknown. Home world: unknown. Aria was left with the council on Dantooine with little information. No explanations, no questions asked, someone passed off the child and disappeared on their ship back into space. With no home, she had found one. With no knowledge of her parents, she was raised by the Jedi Order. From the beginning, the council recognized that the force was strong with her. But, they didn’t know quite how strong. Only when she grew older did they begin to see the aura of the force whirling about her. She was meant for great things, a brilliant destiny as they all hoped and believed. Aria found that there were others like her, simply left with the Jedi. Others were willfully given, parents proud to deliver their force sensitive children to the heroes of the galaxy; the paragons of virtue. She always felt somewhat left out from these stories, thinking of proud parents one day seeing the names of their children written in the annals of history. Would she simply be forgotten and left? Alone, like she started? The Jedi Code helped Aria find a certain inner peace. Raised to see the many sides of all things, she approached situations in a unique way. She refused to study in the ways of a Jedi Guardian, rather choosing the path of a Consular. Aria wanted to focus on her powers with the force, especially healing as it seemed to be her gift. She also took a keen interest to medicine, mixing in ideologies of the Sentinels. Though, many masters would say her true natural gift was saber combat. Even then, she still chose against the Guardian path. She simply wanted to work within the hospitals and help the ailing, to use her gifts to cut down the number of casualties in the undercities of places like Taris. Aria has a sense of duty to the innocent and helpless. But, at every turn they seemed to be proven wrong. When a child was wounded in a kath hound hunt, Aria successfully healed him and refused any reward from the family. Once, she discovered the corpse of a young boy who had died due to an accident in which he fell. Aria took it upon herself to bring the body back and inform the family. Through her experiences with the Jedi, Aria was fast on her way to Knighthood, and was expected to be a great champion of the order. A healer, a true paragon of peace and prosperity. A symbol for the Jedi to live by. Destiny, however, had different plans. Likes: Bodies of water, open fields, history, datapad journals/books, medicine, long discussions with other people, travel, music, exercise. Dislikes: Lightsaber combat, violence, rude people, war, waking up late, laziness, antithetical teachings within the Jedi; particularly the Guardian path. Her sense of humor can be sharp and cunning, but oftentimes falls under slapstick and pranking. She’s a prankster at heart, and even does this to her masters. Playful and fun in that way. Her current emotional state is rather stable and at peace. She’s learned a lot at her young age, but is yearning to know more. Aria wants to find her path and walk it sooner rather than later, to live in her responsibilities and care for those that need it. It’d take extreme things to break her spirit, things she has not faced yet. Even then, her inner resolve may surprise. Status wise, Aria is popular amongst her peers. Many like to be around her and hang out with her. She is mostly liked, but others deem her to be something of a ‘teacher’s pet’ when it comes to listening to the masters; even if that’s not what she’s like. Others, particularly the Guardians, don’t quite get along with her due to her strong opinions on fighting. Virtues: Kind-heart, enthusiasm, honor, honesty, persistence, bravery, fortitude, effort, loyal, leadership. Vices: Ambition, impatience, stubbornness, passion, pride, rashness. Perception of the world: Aria perceives the world, the galaxy, in a somewhat naïve way. She views things like justice in a black and white matter and holds highly optimistic hopes of what her abilities can do for those who suffer. A personable extrovert who can exhibit high amounts of introspective behavior alone, but more often than not she’s seen chatting with other knights, masters, and padawans when she’s not studying. Strong sense of morality, a black and white view of justice although that was somewhat shaken with her first master; Arren Kae. Aria did not spend enough time with Arren, as she feels. Her time with her lingers in the back of her mind, the voice of her first master echoing with an un-nameable purpose. At her age, Aria knows three languages and that number will continue to grow as she is a voracious learner and lover of different cultures; particularly the Echani. Attitude: Enthusiastic, daring, judgmental, passionate, kind. Secrets: Her one big secret is that once, a friend of hers was killed in an accident with a kath hound out in the Dantooine meadows. She showed an immense amount of rage and ended up killing several in anger. Aria has never brought it up to anyone, ever. It’s the single most shameful thing she’s ever done, according to her own feelings. Sometimes, she has dreams of baby kath pups screaming. Quirks: Despite Jedi codes on concepts of love and abstinence, when she’s close enough to a friend; she makes dirty jokes. Tends to find nicknames for people a lot. Talks to herself, and if you’re lucky you might catch her talking to herself in the third person or even having an imaginary argument with the person she’s angry with. When she learns something new, Aria will talk a friend’s ear off as if it’s the most galaxy-shattering fact in the universe. Eats any type of burger or sandwich type meal in a circle, biting all sides until there’s simply meat and bread all chewed up to the very core. Terrified of spiders, no matter how little. Embarrassed by her true laugh, it’s loud and contagious, and it always feels like her collar bone hurts when it happens. Lastly, she has a rather large fascination with Echani hand-to-hand combat from what she has learned. Aria wants to engage in the combat with someone, for despite her distaste for lightsaber combat somehow she loves the concept of truly learning to know someone through action rather than words. Hobbies: Running, reading, listening to music, playing the flute and singing (she’s rather talented), exploring different areas, climbing, learning languages, and pranking people. Her primary goal at the moment is to become a Jedi Knight learned in the ways of being a consular. Secondary goals are to travel across the galaxy and learn different cultures to sate her hunger for knowledge. Also rather keen on finding someone to fight hand to hand Echani style with her. She dreams of being a well-loved healer across the galaxy, to live a life of peace and happiness through the joy of what she can give. Though, she doesn’t have an inclination for master-hood unless it’s of the traveling sort. 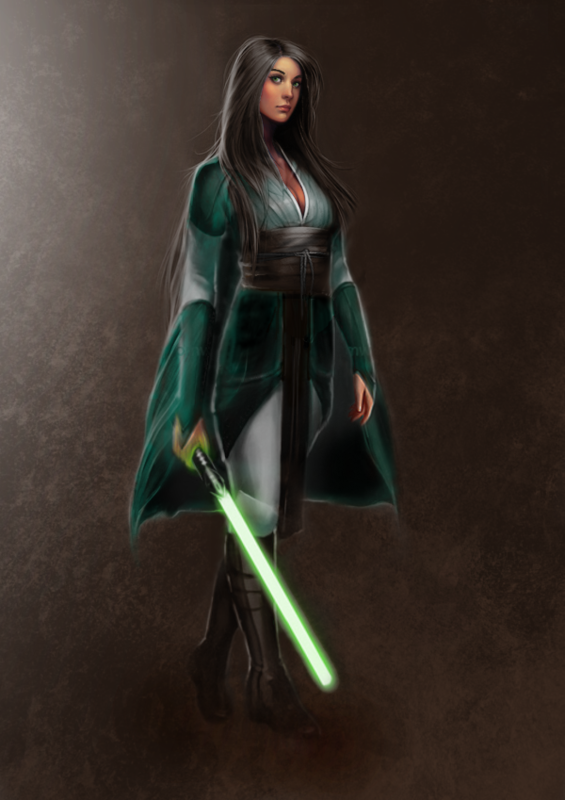 Aria is a padawan who many expect to be among the special cases who achieve knighthood faster than expected. She’s on the Consular path but with some Sentinel leanings in terms of medical practices. A dedicated healer and practitioner of alternative negotiation and diplomacy without violence. She’s a skilled healer through her fierce practice and determination, yet Aria is most gifted in lightsaber combat through natural ability. She shuns that part of her for the most part, however, even if masters implore her that her lightsaber is an extension of her soul. Her powers reside in the areas for the purposes of her learning. Focused healer and a strong connection with the force and the bonds with others. She plays around with pull and push for pranking purposes, don’t tell her masters! Lighstaber mastery level: A cross between intermediate and expert as her natural affinity for it suggests. Her style at the moment focuses more on defense than an offensive assault style. Strengths: Naturally gifted, strong-minded, courageous, born-to-be leader, daring. Skillful healer due to her incredible work ethic. Her medicinal skills are impressive at her level as well. Weaknesses: Overly ambitious, naïve in her idealism, rash, prone to angry outbursts, reckless. Terms of skillsets, a more saber-focused Jedi could take her on or even a Republic soldier and definitely a top level Mandalorian warrior. It will take me a bit to make a character, but fear not. Take your time with it! Make sweet love with that character sheet, lmao. Want y'all to BECOME your character. Just don't get split personality disorder, that wouldn't be cool. um, 1. im confused, 2. does our oc character bio thingy have to be long, becuase if so im not good at it 3. can i have purple eyes that match my purple light saber? 2. I'd like it to be a decent length, a few paragraphs at least. 3. My character has a purple lightsaber and violet eyes. So, the answer is yeah. @Dark Wind expect my cs up tomorrow. Oh and believe me you gonna have fun with this one. I feel like I should add as an extra bit to this: I'd recommend that if we're not all on the same planet to begin with, we should be split down the middle between Coruscant and Dantooine. Or, at least have more than one character on either planet. I'll have my character on Dantooine, and of course run NPC and GM stuff over on Coruscant to get us all rolling. I'm certainly interested in this to be honest. Question though, do all Jedi have to use the Light side of the force? for example what about the Living force, and other aspects? Can we use these? @RogerD i think that as long as it isnt that op or you have a very good reason for it. I think the gm will let it slide. To be fair I was thinking the same, but just wanted to check. I don't for one minute think we'd be allowed access to the cosmic force for example. @RogerD i dont know which one that is mate XD. In the Clone Wars CGI series Yoda goes to a plant (cannot remember the name right now) and learns from the Seers how to use the cosmic force so that he can survive after death etc. it is quite a good episode. When we're talking about the cosmic force, the life after death example: it wouldn't make sense for a padawan or a knight to be in tune with that kind of power. If you made a Master, perhaps. Perhaps they're somewhat close to being able to access such a thing as that could make sense with their abilities. As always, it's about steering clear of the OP-line. As for the question about the Living Force, again it's about the OP-line. I will allow those certain capabilities. Though, keep in mind, in this era any type of Jedi that preaches a balance of dark and light probably won't be viewed so favorably. It's not too long after the Exar Kun War, after all. @boomlover Because I say they did. I'm going to make sure you die first. That being said, I am a newly ascended Jedi Knight in a group I participate in irl, currently studying for my master exams. So ... I guess the purpose behind that statement would just be to show how much of a fan I am.